​Jack Reardon, former SAS soldier and current Australian Meta-State asset, has seen some messy battles. But “messy” takes on a whole new meaning when he finds himself tied to a chair in a torture shack, his cover blown wide open, all thanks to notorious killer-for-hire Ethan Blade. An addictive, page-turning mix of high-stakes intrigue, edge-of-your-seat suspense, and slow burn romance. I couldn't put it down. The masterfully plotted dual-timeline and swoonworthy assassin with a soft side hooked me from the start. well-paced and well-written romantic suspense novel." "It's a ride; captivating, edge of your seat page turner that just keeps going even when you're breathless. . . . The writing is splendid, there's details like no other, and the characters are so fleshed out it's almost unreal." 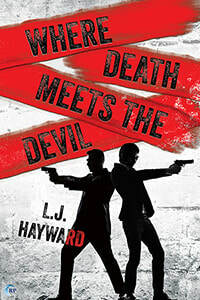 "Hayward's latest is an action-packed adventure with a new twist and betrayal at every turn, leaving the reader gleefully unsure who to trust. 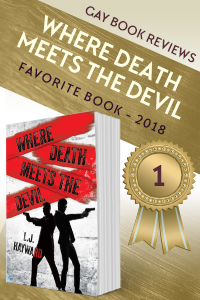 Hayward cleverly builds the intrigue and suspense along with the tension-filled romance, leading us to a climactic ending and the possibility of more stories." "I can definitely recommend Where Death Meets the Devil. If you are at all a fan of romantic suspense, I think you will love this one. It is thrilling and twisty and the plot goes places I never saw coming. The unique structure really makes the book come to life and I could barely put it down. Consider this highly recommended." "THAT is a delicious something of this book; You never knows WHO tells the truth at the very moment, whom can you trust and who play the wrong game. The moment you think you get it, all your soooo nicely built speculations suddenly fly apart. This delightful cat-and-mouse game is EXACTLY what makes this story to such an entertaining and unputdownable read. Add a great sexual tension, good humor and a solid writing and you have a highly recommended contemporary MM Suspense Romance of first-class quality. Be ready for a lot of FUN!"